Friday August 17th signalled the launch of the Helsinki Festival, a two-week arts festival that presents music, theatre, dance, visual arts, cinema and city events featuring both Finnish and non-Finnish artists of international repute. Many of the events are targeted at the over-18s, but the festival certainly does not forget the younger members of Helsinki. The Helsinki Children's Festival offers children activities in the same vein as the adult version, with music, dance and other arts on offer. From August 18th to November 4th, Annantalo Arts Centre presents "Master painter's perfect circle", which is an opportunity for everybody to step inside the Mediaeval Arena Chapel, in which Italy’s painter, sculptor and architect Giotto di Bondone (c.1267-1337) depicted good and evil, and joy and pain using one hundred images. The free exhibition also features a painting laboratory, where visitors get an introduction to fresco painting, mediaeval tools and materials. "Land ahead!" is intriguingly described as "the Helsinki Philharmonic Orchestra in pirate mode", which triggers a flood of imagery. To satisfy your curiosity you will have to attend the one-off hour-long 12€ performance directed by Atso Almila and presented by Lorenz Backman on Saturday August 25th at 1400 at Finlandia Hall. On Sunday August 26th at 1300 the Huvila Festival Tent is home to the Family Day at Huvila, which features an hour-long concert by Mr Heinämäki's Lato Orchestra. The doors and the restaurant open at noon, Mr Herra Heinämäki's Lato Orchestra begin playing at 1300 and events are presented by Silja Sillanpää. Entrance is 10€. Beginning August 30th, Helsinki's Alexander Theatre presents six half-hour shows of Alli Huuppa, written by Lotta Kuusisto, music by Iiro Rantala and costumes by Riitta Röpelinen. Johanna Kerttula stars as Mrs. Alli Huuppa, who has moved from Sweden to Finland. Her neighbours Spelman (Iiro Rantala) and Seija (Lotta Kuusisto) can’t make her out as she seems to be most peculiar. Language problems abound, but all turns out well in the end. Tickets are 10€. From Wednesday August 29th to Saturday September 1st, Ateneum Hall presents Mitja ja kuvitusmieli, a new play written and directed by Katja Joutsijoki for children aged 5–8 about fears and being brave. Each of the six shows last approximately 45-minutes and tickets cost 6€. Stoa Cultural Centre of Eastern Helsinki with Tanssiteatteri Auraco presents Moon Maiden, a performance by a multicultural dance group that is sure to appeal to all aged one or more. Moon Maiden is directed by Päivi Aura, choreography by Päivi Aura and Takako Matsuda, and the music is composed, arranged, played and sung by Pekka Nylund. Each show lasts around 35-minutes and tickets cost 6€. On Sunday September 2nd, the Cinema Orion, home of the Finnish Film Archive, will be holding Cinema Sunday for Children featuring a triple bill of films based on the books by children’s writer Astrid Lindgren. The first film Katto Kassinen begins at 1230 and is in Finnish, the second film Vaahteramäen Eemelin metkut begins at 1400 and Finnish subtitles, and the third Ronja Ryövärintytär begins at 1545 and also has subtitles. Louhi Hall, Espoo Cultural Centre, is hosting Kaijat, a family programme of music and mime by the Glims & Gloms Dance Theatre. 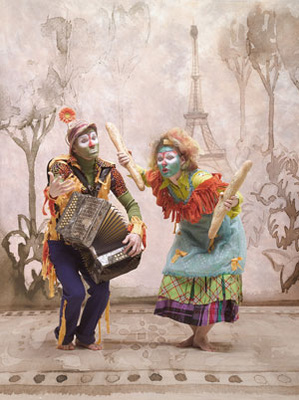 The show is entitled "Parrots in Paris" and follows the dance story of an aging parrot couple who are determined to make a comeback in Paris. Beginning Thursday August 30th, the four 45-minute shows are recommended for the whole family. Tickets start from 8€. For more information, visit the Helsinki Festival website. Wow! Drama, music, Cinema, dancing, and Giotto's Arena chapel too! That surely beats Disney World hands down.